iOS devices are truly multilingual, as you might expect from products based on the Mac OS and developed by the same core internationalization group that included Lee Collins, head of OS Engineering Asia and co-founder of the original Unicode Committee, and senior software engineer Deborah Goldsmith. I don't own an iPhone or iPad but I've played with a few, I have helped arrange several IMUG events on the topic of iOS internationalization and localization, and I have come away very impressed. 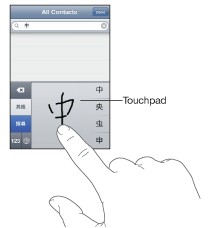 Since the release of OS version 2.0 on the iPhone 3G in 2008, Chinese input methods and fonts have been preinstalled. The fonts show up right out of the box, but you must turn on Chinese input under Settings > General > Keyboard > International Keyboards. Then you can enter Chinese anytime by pressing a little world globe icon at the bottom of the keyboard. 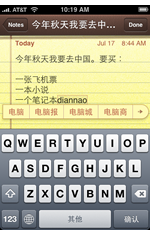 iOS Chinese input methods include Hanyu Pinyin for simplified and traditional characters (yes! ), and Zhuyin Fuhao for traditional characters. There is also a stroke input keypad, and of course there are many additional input methods free and for sale in the App Store. Building on Apple's Multi-Touch technology, the iPhone also offers one of the best Chinese handwriting recognition features I've ever seen...such as it is. Computers have their limits. I often recommend Macs and iPhones to people who are less interested in how their computers work than in all the cool things they could actually do with one if they could just get it to cooperate. More about where to find Apple product support is on my Chinese Mac page. "Microsoft", "Windows", "Linux", "Apple", "Macintosh", "iPhone" and any other trademarks on this site are the sole property of their respective owners.